This post is a follow up to a post/review I did last year on Benjamin Moore Advance paint. You can read the first one here. I’ve been receiving emails almost daily about my opinion of this paint now that I’ve used it a few times and lived with the paint on pieces. If you want to know details about this paint like cost, ease of use, plus pros and cons please check out that first post. My initial thoughts can be found in the original review post, but here is my current opinion about using Advance on furniture. Let me be very clear in saying these are my opinions and my experiences. Other people may have opinions and experiences that differ from my own and that’s great. I welcome those. There are also others who have found ways to successfully use this paint without the same problems I have encountered. I also want to say I love Benjamin Moore and am still a customer who uses their products. On my quest for finding the best paint I tried Benjamin Moore’s Advance in April 2015 after reading good things about the paint online and at the recommendation of BM employees. I took the plunge and bought one gallon of off-the-shelf white in high gloss. My first experience was pretty good and so a few months later I purchased a difference color for another furniture project. After I initially posted about using the paint on this dresser (my first project with Advance) I received numerous messages from people who had also used Advance and had bad stories, although admittedly some good experiences as well, like me. I listened but hoped those things were not true for everyone. After painting the Salsa buffet, I was no longer a big fan of Advance. I had problems with crazy orange peel (even with thinning), coverage, curing, and durability. Now, I had hardly any of those problems when using the white color, but the saturated color of Salsa was a whole entire different story. The 2 biggest things were 1. durability. The paint came off too easily. Little dings kept happening on edges and corners without the piece even being used very much. And 2. curing. I guess that kind of plays into durability, but that paint does not cure (well). So much so that I never even sold the piece that I used the paint on. A year later it is still kind of tacky and sitting in the garage. Very unfortunate because that’s a killer piece that I feel has gone to waste thanks to a bad paint choice. It’s going to a family member who is aware and okay with its imperfections, and maybe one day I’ll redo it. This paint is also very prone to drips and sags which are a paint to get out since the paint stay tacky and is difficult to sand. Some people may not be concerned with the little spots of wear I saw on this piece, but as someone who refinishes and sells pieces I’m not willing to continue using this paint and take chances on the quality of the finish. I gave Advance one more try when I painted a 9 drawer mid century credenza last October. The piece turned out well and I did not have the same problems I had with the Salsa piece. It did take a little longer to cure and not be sticky, but it did end up curing. I also painted my mom’s fireplace mantle with the high gloss white Advance and never had a problem with it being tacky. Items sit on it for months at a time and when they get picked up they don’t stick at all. So, all that to say I had good and bad experiences. In some cases the paint seemed like it was a great option, and other times it didn’t provide the quality I wanted. Here is a list of things that I think play a role in the curing and durability of Benjamin Moore Advance. I will also note that from what I understand, the VOC regulations set by the EPA for certain paints are so low that there aren’t enough VOC’s for paints to cure well. Ultimately, I would say this paint is not best for furniture. There are other paints and finishes available that offer superior quality (in my opinion). When it comes to an item, like furniture, that sees more wear, a durable finish is needed. I still highly recommend General Finishes acrylic milk paints and High Performance Topcoats. As I am trying to do away with topcoats I have been trying oil paints. There will be a post about my experience with that later on. What this paint is good for are surfaces that do not see as much high traffic. Specifically surfaces where things are not set on it. Trim, molding, fireplace surrounds, doors, etc. would be great candidates for this product. It might even work for the frame of a piece of furniture (sides, legs, and drawer dividers) since those areas don’t see high use like furniture tops. I wouldn’t say I won’t use the paint again, because I would use it again. I will just be cautious about where and how I use it. In instances where I want a pure white, oil white can’t compete with a water-based white. That’s where I would consider using Advance again. For now I am still on the quest to find the best paint for furniture. There will always be pros and cons to each and there is no perfect paint, but I’ll keep you in the loop as I experiment with new (to me) products. Isn’t milk paint kind of transparent? What if you are looking for a paint that isn’t transparent? What else have you used with success? No, milk paint is not transparent unless you water it down or use thin coats. Traditional milk paint, which come in powder form and you mix up, is something that can be mixed into a thin form and be transparent and used as a wash, but General Finishes Milk paint (which I mentioned in this post) is an acrylic paint. It comes in a can like regular paint and is really great for furniture. GF paints or Sherwin Williams acrylic/latex would be my water-based go-to choice. I’m skeptical that Sherwin Williams products are any better. I went to one of their stores and told them I was painting furniture. They recommended I use latex all surface enamel. I had them mix up a dark brown paint, I believe the sheen was satin. I painted a coffee table and it was still tacky months later. I’ve used SW Pro-Classic with a topcoat (it does need one to not be sticky) and it’s been great. If you don’t want to be dealing with a paint and topcoat pair then it’s probably not right. Sorry your project didn’t go as planned… I’ve been there many times! I don’t think that Pro Classic can be mixed in dark colors because it doesn’t come in a deep base or something like that which is why they gave me the all surface enamel . I had good luck with Benjamin Moore waterborne satin impervo. I only ever used white, not sure if that can be tinted dark either. What are you implying when you say top coat? I used BM Advance in majenta/purple on a dresser for my daughter. The saleslady told me it would be self priming and would harden really well. I painted it and waited over 2 weeks before moving it to her bedroom. Within a few months it had numerous nicks and dings. it was disappointing as I had put effort into making over my daughters room for her. it was just a pressboard dresser so not a big loss other than the time and the desire for her to have a pretty room. it is good to hear that the white holds up better. I’ve been told by BM employees that Advance is great for furniture and I definitely disagree after using it a few times. You have to be so careful and prep and prime really well. Even then, it doesn’t cure well. I do think there are other paints out there that better suited for furniture. Thanks for sharing! I don’t know why she would tell you it primes itself I always recommend priming with stix when painting on cabinets or furniture. If it’s bare wood the Advance primer is best. I could see how you would have issues with it chipping. I am a painting contractor, I DO NOT BELIVE IN A SELF PRIMING MATERIALS, alway prime regardless, also when you are dealing with deep colors, it will take at least three coats, so try to spray very light coats and wait over night in between, deep colors take longer to dry. Also when you finish your project make sure to understand that the paint is dry but it will take over a month to cure hard. Never trust 100% the person that is behind the counter, they are good people but they are not painters, the know what you can know if you read the back of the paint can. Best advise is to write in places like this BEFORE YOU START YOUR PROJECT, so you can get the best advise. I’ll look into it and see. As I continue trying to find the best paint for me I’ll share my thoughts and experiences. 🙂 Thanks for reading! Reeves, you know I am a fan of General Finishes products for furniture along with their HP Top Coats. When we moved into a new home a year ago, our painter used the BM Advanced on the trim and it’s held up beautifully. I decided to paint the bookcases in our family room with the leftover BM Advanced and it’s still not fully cured on the horizontal services…and it’s been about 10 months now! So needless to say, I’ll not be trying the Advanced on any furniture pieces but I’d use it in a heartbeat on interior trim. Yes Robin, the curing can be a problem. Was it white or a light color? Regal Pearl is a better product for horizontal surfaces because it cures quicker and won’t be as tacky. It’s still super durable. I have used advance to paint my entire kitchen, trim, and doors and could not be happier. The key to Advance is to use thin coats and let it cure for at least 48 hours sand if needed and recoat. If you do not allow the first layer cure time you will have tacky issues. I have done that. Thin coats and letting it cure for a week between coats and it still never fully cured. It’s just not the best paint for furniture. I used benjamin moore advance (white- no tint) on solid maple kitchen cabinets I made along with all the mouldings and wainscoting, shelves etc, made out of oak, pine, maple and poplar and found it to be the best paint I ever used. I followed the salesperson’s advice and used the advance primer (2 coats, applied at least 16 hours apart) and then several thin coats of the paint also waiting at least 16 hours between coats. It literally took a month down in the basement 3 hours a day to paint all the wood for my wife’s dream kitchen. But I was patient because after custom making all that stuff it was a labor of love. The all white woodwork kitchen has held up for a year with no problems- I have six kids and a wife who just about lives in that kitchen and that paint takes a beating but easily wipes clean, doesn’t chip and stays glossy and fresh looking. Kudos to you for taking on a job like that to make your wife a happy gal! hello! we are thinking about using BM Advance for our kitchen cabinets.. did you use satin or semi gloss? thannks! I’m doing my kitchen cabinets. Bought a HVLP sprayer. Started with STIX primer with I think is now owned by BM. I then followed with BM Advanced in a gray. I’ve only done one draw and door panel. The wife does not like the color so I’m switching gears. After reading your review on Advanced I’m looking for a different “best” paint recommendation. I am going to use General Finishes top coat. So the million dollar question, what would you recommend? I would consider an oil based paint (unless it’s white/light because it could yellow). An acrylic with high quality topcoat would be good too, just don’t cheap out. I painted our kitchen cabinets with Advance and love this paint. The finish is perfect and has dried hard. I primed with zinsser and sanded between coats. We used a sprayer and sprayed it thin. One coat of primer, two of paint. The cabinets look professional. I’m giving Advance Semi Gloss white a try on some custom bookshelves I’m building. Shiela – did you prime with Zinsser BIN or 123? I went with BIN, as it’s been my standby for blocking any stains from wood knots bleeding through, and sticks to anything, have never had any issues with it as an undercoat for any other paint. Just put on the first coat (I learned the hard way that Advance needs to be back-brushed to take out any bubbles left by the roller, even a nice Purdy 1/4″ nap left tons of bubbles), waiting a day before hitting it with some scour pads and putting the second coat on, will see how it goes! Awful experience with this paint! Built closet drawers and shelves 6 months ago and used Advance. It seems to be holding up very well. Did our kitchen islands with advance, semi gloss,dark grey a month ago. Some new wood, and some over existing factory cabinets. Seems to be doing fine. Most had one coat of primer, 2-3 coats of paint. Combination of brush, roller and spray. Currently painting all kitchen cabinets – they were factory finished very smooth wood. Spray prime, sand, then 3 coats. Have some done, looking good. Did one with no prime and it looks even better. SEEMS to adhere well after a good cleaning and very light sanding. They have been drying well – using a cheap (Wagner Flexio 890) and working well. Been able to sand after 20-24 hours just fine. What did you use to sand between coats? I’ve had good luck with white satin Advance on all my trim work. I’ve painted crown molding, matchstick wainscot, stair risers and skirt boards, base and shoe, etc. and it dries to a nice, smooth finish with pretty good self leveling. There was an initial learning curve for how thick to brush on the paint. Too thick and I got sagging. Too humid and it went on too tacky and was hard to smooth out. Adding a tiny bit of water seemed to help. I mixed a little water and paint in a separate container, not in the can. I have not tried it on furniture, but appreciate all the info above that there are better choices. In my experience, Advance has given my woodwork a nice, smooth and crisp white finish and I plan to use it throughout my home. Thank you for your informative blog posts! Hi, It is interesting that when I painted my kitchen cupboards in our trailer the Advance paint went on beautifully and so now I am trying to paint some furniture. I used a sponge roller and got tons of bubbles everywhere. So I tried using a fiber roller and got the same thing. I called the store to ask what I am doing wrong because these are the same rollers I used for the cupboards. They recommended me using a brush and now I have streaks. I sanded and try again and still have the same results. So frustrating especially when I loved using it the first time. It’s a big expense for the troubles. This is an update from my last comment. I took the can of paint back to the store and they replaced it with a new gallon. The batch I had must have had something wrong with it because the new can of Advance was perfect and went on beautifully. full circle – I bought Advance a year or two ago (trim and cabinet – white hi gloss and reg. gloss to splay with a Apollo HVLP) based on advice form this website! That experience was fine, and product held up well. Coincidently stumbled upon you again because I was searching for a brushing trim. Based on everything I’ve read as of know – I’m going to pick up some more of it. I definitely respect your opinion – but I’m also using white. Here’ a tip of two for others… Mix the paint REALLY well – even it it was shaken at store the day before. Normally – if the a normal paint was shaken within a week, I wouldn’t even consider spoiling a stir stick, but this one needs blending. I now have a small drill mounted spinner. For spraying, I used Apollo’s latex needle – sorry don’t remember the size it’s called, and thinner with water. another note – it’s really interesting that you suggest that the environmental concerns are limiting the amount of ‘solvent’ they are able to use – and that’s effecting the paint. I used Linen White and also a Dark Brown on our kitchen cabinets about 3 years ago and they have held up great. I’ve also used black on some cabinets in ouir family room and those have held up great as well. I sanded the cabinets lightly, primed with a Zinser 123 primer. The based cabinets were painted with a foam roller and brush and the doors and drawer fronts were sprayed. I am in a dry climate and humidity can cause problems for Advance paint. The specs say that you should wait 16 hours to recoat in mild conditions (warm temps and low humidity). Lower temps and higher humidity you have to wait longer. Also, Advance paint can take up to 30 days to completely cure and harden. In my experience, it’s not hard to apply, but it does have things you need to take into consideration that you don’t need to worry about with regular paints. Hi Reeves- I, too, have had a disappointing experience with BM Advance on two night tables. Too many drips and tacky two weeks later, drawers sticking, etc. Grrr. I need to paint new oak kitchen cabinets WHITE. It’s a vacation home out of state, so waiting 16 or 20 hours between coats isn’t an option when I’m only there for a couple days a month. Can you recommend a brand/line of paint that I can turn to for kitchen that needs to look good but not too hard use and won’t take the rest of my life to complete, please? I love love love General Finishes and that is my first go to usually but I have been using the BM Advance lately in satin only and I love it- I have both rolled and sprayed on- I feel like my finish was flawless with the spmrayer once I got the correct amount of water mixed in! I have used BM Advanced on furniture and my kitchen cabinets. You should also know, I am a professional painter. I never had an issue with anything I painted with Advanced. Why? I prepped the surfaces properly. First, I completely and totally remove the previous finish on a piece of wood furniture. To get the job done quickly, I use a sander with 40 grit paper. Afterward, I repair dings and dents with wood filler. Next, I sand the surface again with 80 grit, then 100 grit and 150 grit. The step is priming. If the primer does not coat evenly — guess what? You did a crappy job sanding and left some of the original finish. After applying two coats of primer. I let it cure for 24 hours before lighting sanding. Then I apply the Advanced paint using a spray gun. If you don’t have one a high-quality nylon brush (not a roller) will get the job done (it’s self-leveling.) I painted my kitchen cabinets two years ago, and they still look flawless. The same goes for my desk and built-in bookcase. A lot of people use a deglosser instead of standing- BIG MISTAKE. The paint won’t stick, and eventually, it will chip or orange peel. 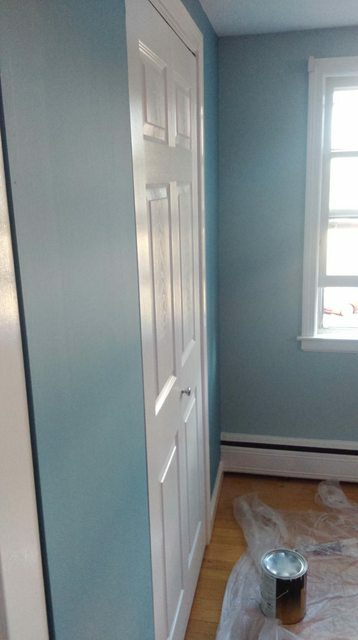 May I ask what kind of primer you used to paint your built-ins with the Advance paint? I agree! Priming and prep is the key! First time I tried this paint and love it! Took off all doors and drawer fronts. primed with Advance primer – I used a 2″ angled brush and the velour 4″ roller as recommended by the BM employee. dried 24 hours. sanded. wiped off dust. waited 3 days or so before I reattached the doors and drawer fronts. I was meticulous in my application. I used thin coats. I was patient. And it absolutely paid off. My kitchen is stunning. When professionals come over to do handywork jobs or whatever, they always comment how great my cabinets look and other than knowing they were painted, they can’t even tell. Some added benefits – there have been a couple places that got scratched… from pointy objects. It’s a kitchen. dropping knives happens LOL … touchups are a piece of cake and blend right back in. I just sand, apply a dot of primer on any of the base wood that is exposed and follow the same methodology with applying, drying, sanding, applying 2nd coat. you cannot see the touchup spots. I used satin finish on all of my cabinets. I’m currently painting an old sleigh bed frame in the wind’s breath. the one point I will note is that I have not painted any horizontal surfaces with advance yet, so that may be the point where the curing really has an impact on the usage of a piece. I don’t see that limitation impacting the bedframe project though. My advice – advance is the best product out there for kitchen cabinets. If you’re painting furniture, consider how the piece is used and whether you can wait to let the paint cure properly. If the answer is no, then don’t use advance. if yes, the go for it. I have GF milk paint on my cabinets currently and would like to change the color. I am looking at the BM Advanced. Do I need to completely remove the GF milk paint first or will sanding and priming be enough to achieve a good finish? Advance is a product that was developed and is renowned for it’s durability to be used on furniture, cabinet doors and trim. Depending upon the retailer, you may not have been given the recommended steps. Others decide not to follow every step and improvise on prep recommendations and products. -First step is to give the entire piece a scuff sand to “rough up” the surface and give teeth to the surface to accept product. -Second step is that this product absolutely requires specialized primer underneath it. The very best recommendation is Stix Bonding Primer (which is a thinner primer used for adherence of the Advance) or Fresh Start (which has exactly the same adherent properties as Stix in it, however also has the benefit of higher hiding qualities to cover darker colours or to provide a thicker coating and fill in very minor imperfections or minimize wood grain). Both of these primers act much like double sided sticky tape, adhering to the item being painted and to the Advance paint. Without it, the Advance will be at high risk of chipping. The Advance product line now has it’s own primer, however I have not received any feedback on it yet so cannot speak to it’s results. -Third step, when the primer has dried (4-6 hours) is to do another light scuff sand to rough up the surface again to give the Advance something to stick to. -Fourth step is your first coat of Advance. After you apply this coat, you will have to be very patient as the second coat must not be applied for at least 16 hours. It is a longer wait time, but the longer wait time is due to it being a waterborne alkyd paint with the benefits of a soap and water clean up. The long wait time is also what gives the product it’s “self levelling” properties and is why you see few, if any, brush stroke marks in the final result. Other added tips are to use the softest bristle brush you can find (I like the Wooster Silver Tip), and if you use a roller, use a flocked roller with the tiny “hairs” (they are usually yellow foam rollers that look very slightly fuzzy), as the “hairs” knock down any small bubbles that arise while applying the Advance paint for a smooth application. -Fifth step is to do one more very light scuff sand and apply the final coat. It is very important to note that the product does not cure to a hard, enamel-like finish for 30 days. After that time, you should end up with a durable, chip-free, peel free finish that will last for years to come. Items that are placed on a shelf prior to the full 30 day cure are likely to leave permanent indents, again because of the self-levelling properties of the product and the product not being fully cured. If you are having issues of colour coverage, you also have the option of using a tinted primer. This is usually a rare issue noticed with very bright or deep colours and can also be resolved with a third coat. You can also return to Benjamin Moore to have the product adjusted with more tint. The only people (not too many) I have ever seen return with disappointment in the product omitted one of the steps or just disregarded the advice about the use of the product altogether. Almost every customer I have sold this product to that followed the directions has returned to either tell us how pleased they were, buy more for a different product, or has referred friends and family to purchase the product themselves. Allison… Which Fresh Start formulation is recommended if STIX is not used? Thank you! Sorry… I meant to type Alison!! I have followed these steps as stated by the Benjamin Moore sales person, with the only issue being the primer used. I had already used a Kilz oil based primer before I purchased the paint, and mentioned that before purchasing it and was told it would be fine. Hopefully they will be. My question though is if I can use a top coat with this and what kind. I am assuming a polycrylic would be ok? Leslie, definitely a WB poly, however make sure your paint has cured a spell before applying. The paint and poly dry at different speeds so uncured paint can shrink and cause your poly to craze. It’s not designed to be top coated and it doesn’t need one. Been reading the comments here and saw the one about Emtech 6500 (from Target Coatings). I’ve used that and been happy with the results–and the guy who owns the company, Jeff, is great with answering any questions you have. Best part is he custom matches BM colors. I usually order direct by phone, but I think you can order online too. Here’s the number I use 800-752-9922. I’ve been painting furniture for many years and have never had this problem until recently. I sanded (it was an antique) primed with an oil based primer and painted with a sprayer SW paint, waiting 24 hours between coats and sealing with polycrylic. It was still tacky and peeling off weeks later. I went back to SW to see if they knew anything that could have resulted in this outcome. After calling a few of their troubleshooters, they came to the conclusion that it was a bad batch of paint. I did notice that it had a strong odor but was not the usual paint smell. It was a deep yellow color and they also said (initially) that it could be due to the color/base. Since I’ve never run into this issue, I’m guessing it was just a bad batch. Next time I smell something that doesnt smell like the usual paint smell, I will return vs using. Hope this helps! I agree that both BM Advance and the SW ProClassic are less than optimal compared to oil base as far as durability. I think the SW is better constancy, sprays easier and dries a little faster while the BM is slightly (and I mean just slightly) harder. I was recently recommended to try SW SHER-WOOD® KEM Aqua® Plus White. Supposed to dry hard (re-coat) in 30 minutes and usable in 12 hours although the person (NOT SW employee) said he always waits 24. Best feature is water only cleanup. I just ran across your post this morning – thank you for the detailed review! I painted all of my kitchen cabinets with Advance 2 years ago. It’s an off-white shade (half white, half linen-white blend) and have had no problems with it. It’s the Satin finish. That said, they were knotty pine cabinets to start with the original shellac on them. I sanded and primed every single surface before painting. Not sure if that made the difference or not. I occasionally have a ding or to touch up, but with 2 teens in the family that’s to be expected. Additionally, all of the trim work in my house is painted in semi-gloss, same white/off white mixture. No problems there. I wonder if part of the problem is in mixing the deep colors? So much of the base has to come out to then add the tint – wondering if that impacts the consistency/lack of curing of the paint? I am in the process of painting a bathroom vanity cabinet in a lighter grey color – again, in Advance – will update on how that turns out. Again, thanks for your info! Benjamin Moore’s GenX tinting system actually makes the paint stronger. It is a urethane resin. Try milk paint with a water born urethane in your desirable sheen. Two coat and your finish. So sorry to hear that all of your effort and money went into the project and your results were not as you desired. I have used all sorts of paints for furniture and front doors for over 30 years (I am 56) and, hands down, for finish, luster, pop and durability, there is NO paint that can compete with Fine Paints of Europe Hollandlac. It is VERY important to use all products recommended and as directed but, once that is done you will find the resale value of EVERY piece you sell can be increased by 10 to 15% just from the look of the finish alone. FPOE is the ABSOLUTE best! It came out Ok, never had a problem with it not curing but I did leave the doors out in the harsh CO sunshine so they dried nicely. I see lot of folks like this at the home depot site CabinetCoat and you don’t have to use a primer. I end up using KILZ primer on some of them. Not a glass like glossy finish but they look OK for the cost and first time effort. I may try spraying Advanced with the bottom cabinets I still have to do in the next few week, who knows !? I’ve used the advance on a vanity and a couple of side tables and I have to say I love it. I have not had the issue you spoke about it went in a dried I too allow to dry 24 hrs to ensure it is dry. I have used the Behr alkyd enamel and had issues with it being tacky and was worried this might be the same as it is an alkyd. I am currntky using in a kitchen table but will try a polycrylic top coat to ensure durability. I have used Advance on several large built-ins, dining room table and chairs, and other items. All were sprayed with a Fugi 4 system and primed with BIN. Most were shades of white but the colored pieces turned out the same. Namely wonderful. I live in a low humidity area and that may be helpful because they cured quickly and were hard after about 3 weeks. ( And any finish that that takes days to become non tacky is quite possibly a defective batch.) That said I did thin the Advance to ~45sec so it would spray w/o orange peel. Two coats of BIN and two coats of Advance and i have a happy wife and I am very self pleased also.The house trim was brush painted and this product smoothes out beautifully. Their is a learning curve both for spraying and brushing and directions should be followed about curing times etc. Fine Paints of Europe (finepaintsofeurope.com) seem really proud of their paints, and so do the painting companies on their website. They seem to have excellent results, and they provide reams of advice and instructions etc to get the optimum results. I’m currently looking at Hollandlac for kitchen cabinets. 4 years ago, I used Advance Semi-Gloss in a color matched off-white to paint a large concave brick fireplace, hearth and brick wall (matched my trim color). The paint went on like a dream and has been as durable as the sales person promised it would, hardening very nicely. I cleaned the brick prior to painting, but because it was already newly coated with a flat white paint, I did nothing else to prep the surface. In this application, it’s been as or more durable than the oil base used on the rest of the home’s trim work. More recently, I used Advance to paint some newly installed, pre-primed baseboard. Again, went on easily and, so far, has done very well. Somehow it seems that to have so many comments both happy and disappointed on a highly touted, very expensive, major brand product is not actually a win for BM. I’ve been painting with BM Satin Impervo for over 20 years. I have never been unhappy with the product. It takes thorough prep and meticulous painting (I paint with a brush) and it comes out perfect every time with perfect leveling, coverage and durability. People are always surprised it wasn’t sprayed. But when I wanted to repaint our kitchen cabinets in our new house (new to us) I decided to use Advance products because I wanted the white to stay white and much of the kitchen doesn’t get a lot of daylight as it’s large and those areas would yellow with oil. I was also tempted with the thought of easier clean up. It was a mistake. I had 19 double cabinets: 40 doors, 13 drawers, along with book shelves and a coat nook, and of course trim. Being the ridiculous perfectionist I chose to paint the insides and out of each drawer and cabinet. Prep: 1. degrease with a mild degreaser like a dawn and water solution to get off dirt, food and grease. 2. rough up all surfaces with sanding to open up the gloss finish on the wood stain. 3. wipe clean 4. use Paso Deglosser as recommended 5. prime with Advance primer. 6. after 24 hours paint with Advance. 7. after 24 hours paint again (lightly go over before with steel wool if necessary to smooth out then remove all dust) 8. Repeat 7 for a third coat. The finish looked great. smooth and although less thick than Impervo it had pretty good leveling. It looked sprayed and I had no drips (I”m a meticulous painter). I waited three days to put doors/drawers back on and over two weeks to put anything in the cabinets. The doors and drawers started chipping almost immediately. It was completed in November and any movement of the wood (we live in KS so hot/cold) caused the planets in the doors to crack at the connections. NO, not the insets, the edges where the outside frame of the doors are joined. Then, dings started showing in any places where there was human contact. I was devastated. The Island is painted with Satin Impervo in a color and it’s held up for years with almost no wear at all and it’s where I keep pots and pans and cook every night. I feel burned by Advance. I need to fix all of the cabinets and have no idea whether to repaint with oil, to try to fix with advance only to be disappointed again for an effort wasted, or to burn down the kitchen and move. Ugh. I have been using Advance paint for over a year! I started using in kitchen and bathroom cabinets! And have been doing furniture. I’ve have no issue at all I love the paint it gives the smoothest surface I’ve found so far! With that said. It does have a 3-6 month cure time which means that’s when it’s at its hardest and most durable. But I am able to hang doors after a 4-5 day dry time, with no tacky ness. I prime and paint two coats each side I sand primer and the 1st coat of paint with – fine sanding block lightly and wipe with denatured alcohol best paint I’ve ever used! I live in Michigan. And I did do a job in Florida and I think the elevation and humidity play a part had a harder time with that application! My paint store guys told me Advance is not recommended to spray! I use Wooster green handle brushes and Wooster big green 4” rollercover, it’s a flawless finish! Prep is key. Gotta degrease and sand with 150 grit before priming and always wipe clean with denatured alcohol! It’s a tedious process but worth not having to use top coat. Which I used to do with GF milk paint and high performance but it yellows on whites and off whites for me! I used the Advance in a pearl finish color white for all of our interior doors, baseboards and cabinets and it turned out great. Great to hear! Since this post I have used Advance in Satin on interiors doors, trim and laundry room cabinets. It’s help up pretty well so far and I will probably do an update covering my experience with the paint for those used. I never want to use any other product. Since we are on topic, I have sprayed / brushed B.M.’s advance, but reluctantly. These were on built-in projects in which the client had used the product already in the home. It comes out in glops with my spray gun unless I thin with their reducer and doesn’t cover well (even their whites don’t) and therefore requires recoating. Hi, I have only pretty limited experience with Advance, but wasn’t extremely impressed at it. One paint that used to be very good was Muralo Ultra. With Muralo Ultra it did in fact dry as hard as oil, but was a standard 4 hour dry time paint, with only 2-4 days or so to cure to rock hard. I even on personal furniture items put it on over oil based paint and poly with only a light scuff sand of the poly and not sanding oil at all and it stuck 100% perfect and was rock hard after curing. Muralo’s difference as I understand it was it was a latex paint, but alcohol based instead of glycol or ammonia based like other latexes usually are, so that’s why it had really good adhesion. I tried the newer California Ultra (company who bought Muralo out) and I feel unfortunately it’s not quite as good as Muralo, but still pretty good. Nothing after a week out of the job was tacky enough for things to stick or anything, but it went from rock hard to just pretty hard after the branding switch and leveling is not quite as good anymore :/ I’m tempted to try California Ultraplate (their cabinet paint) or Nextech (Nextech is their WB hybrid competitor to Advance) or their Ultra ceramic paint, and maybe those will be harder, but there’s a very limited number of California dealers where I live compared to BM. Hi my name is Bill. I enjoyed reading your post and wanted make a few comments which I hope might help. I sell paint for a living and wanted to give out some knowledge of paint. For the most part there are three main bases of paint white, medium and deep. The last two may have different names but are the same thing. Titanium dioxide(white colorant)added at about 30% to 40% makes it a medium base. The amount added varies by manufacturer. Also being an expensive colorant makes the price go up. Next up white base or just pure white, has about 70% to 90% white added. 3rd one white for just plain white or off whites and light colors. Now another important part of the issue, the colorants added at the paint store. Colorants are made by suspending pigment powders into a medium. This medium is made to not dry out, in the machines they’re dispensed from. Too much of the colorant added to the paint will make the paint not dry correctly, stay sticky,tacky, chip easy,peeling, and a host of issues. This problem is more common in darker colors, so paint problems may not equate to a bad paint but instead bad formulations! White paint usually not a problem, because white powder(not suspended in the liquid medium) is usually directly added to the base paint. 1 last point, colorants with oxides(metal based) have better coverage, so darks with more colorants that don’t have oxides are more transparent. These are going to take a lot of coats. I’m getting ready to paint my oak kitchen cabinets and I am on a quest to find the best paint. I’m so confused. Some people swear by one thing and others say no it’s horrible. Would General Finishes Milk Paint be good with their topcoat? Do I need to do anything special with the oak grain before painting? I am just so fearful of having a chippy mess?